- Each bottle comes with a high quality carabineer and optional sports tops are available for all sizes. - Capacity: 20 fluid ounces (600 ml). Materials: Hand made from high quality #304 (18/8) food grade stainless steel, which is naturally safe unlined. We recommend using a baking soda or diluted white vinegar wash to preserve the clean, neutral taste over time (brush as needed). 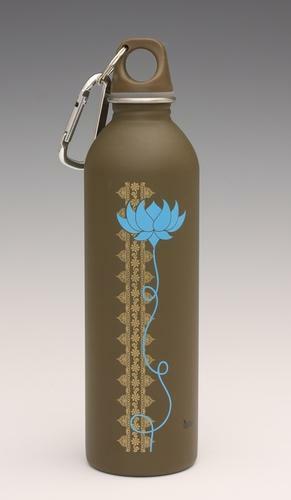 EarthLust bottles are ethically made in China and designed and tested in California. Custom design - not stock bottles. Most of our line is limited edition - new art will arrive soon! Non-toxic paints are used and BPA-free safe polypropylene #5 caps. Every bottle helps to eliminate waste and gives you a safe and stylish way to have a cold beverage near you at all times.